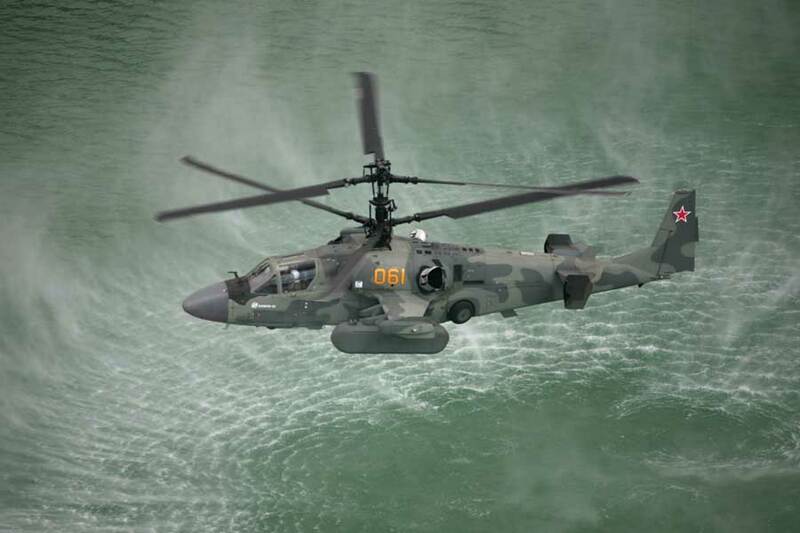 Ka-52K helicopters manufactured by Russian Helicopters holding company (part of Rostec State Corporation) completed the first phase of testing in marine conditions. Ka-52K helicopters manufactured by Russian Helicopters holding company (part of Rostec State Corporation) completed the first phase of testing in marine conditions. Ka-52K helicopters manufactured by Russian Helicopters holding company (part of Rostec State Corporation) completed the first phase of testing in marine conditions. The machines are currently in the premises of Kamov Design Bureau where specialists finish assessing the condition of helicopters and their components after performing tasks in harsh climatic conditions. The use of corrosion-resistant materials is another important feature of Ka-52K, as the helicopter is to be operated in wet maritime climate. The helicopter has a single-point fueling system and an upgraded air conditioning system which ensures ventilation of immersion suits of crew members. Besides, the helicopter has a short-range radiotechnical navigation system which was not used by the basic model. Rostec is a Russian corporation, created in 2007 to promote development, production and export of high-tech industrial products for civil and military purposes. It is comprised of over 700 organizations, which form 9 holding companies in the military-industrial complex and 6 in civilian industries, as well as 32 organizations under direct management. Rostec portfolio includes such well-known brands as AvtoVAZ, KAMAZ, Concern Kalashnikov, Russian Helicopters, VSMPO-AVISMA and others. Rostec organizations supply to and operate in over 70 countries. Consolidated revenues of Rostec companies in 2015 exceeded 1.14 trillion rubles (over 19 billion USD). According to the new Rostec strategy, the main objective of the corporation is to provide a technological advantage to Russia in highly competitive global markets. The planned investment volume for the development program until 2025 is over 4.3 trillion rubles (over 70 billion USD).